After a quarter of a million US dollar upgrade, Great Huts, one of Jamaica’s most distinctive resorts, has something new for visitors seeking an Afro-Caribbean vacation in a rustic setting this spring and summer. The Jamaican resort opened its brand new Queen of Sheba and African Sunrise huts as part of its renovation of the Port Antonio property which offers a secluded beach, jungle and panoramas from its cliffs. The completed renovation and upgrades coincide with the current 2010-2011 winter tourist season which has drawn guests from as far apart as Poland to the Pacific northwest of the United States. Dr. Paul Rhodes, proprietor of Great Huts, said the upgrades at the property were timely and augur well for Port Antonio. “The new Queen of Sheba and African Sunrise huts are part of an overall strategy to maintain a broad appeal to visitors and to prepare for what we believe will be an eventual upswing in the island’s northeast coast. Great Huts offers breathtaking views, all in a rustic environment but in a quality setting,” noted Rhodes. The Queen of Sheba, which can sleep up to eight guests, features honeycomb coral and limestone boulders, a 30-foot in diameter bedroom with hot tub, small fish pool with water fall, and is adorned with fabrics and ornaments from Côte d’Ivoire and Jamaica. 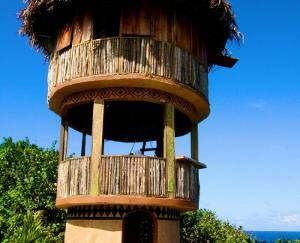 The third level of the hut offers a breathtaking view of the Caribbean Sea. The African Sunrise is a 30-foot tall lighthouse-like stone structure with panoramic views of the Caribbean Sea and Jamaica’s beautiful mountains. The structure sits 15 feet from the edge of a 70-foot cliff. While favored by adventuresome honeymooners, this dramatic unit is not for the faint of heart. African Sunrise also features a memorial to the souls who perished in the Atlantic slave trade. 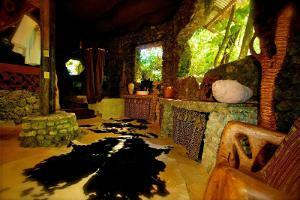 The “at home” Afro-Caribbean experience begins the moment guests enter the cozy and inviting jungle surroundings at Great Huts. A virtual jungle garden, Great Huts provides a natural, relaxing and refreshing environment for the discerning and spiritually conscious traveler. Guests are known to return because of the knowledgeable and friendly staff who greet them with warm Jamaican smiles. With its physical renovation complete, Great Huts – a cool alternative to the traditional villa vacation – has been promoting its faith-based packages to Jewish, Christian and other believers for the Spring and Summer seasons. Since its opening in 2001, the property has been developed in an environmentally responsible manner, and has become an integral part of the community and beloved by its numerous repeat visitors. Built upon a four-plus acre plateau atop the northeast point of the Jamaican coast, Great Huts is an intimate vacation village of comfortably furnished dwellings, including Wi-Fi in communal areas, expansive cliff side views with dining areas, hammocks everywhere, a lovely beach and a sea pool. Activities range from total relaxation and quiet water sports to dramatic day trips such as valley hiking, river rafting, mountain climbing or a visit to a Kingston museum, gallery or historical/ spiritual attraction.